*If you are on a mobile device, click the + button to access more recipes. This is a great smoothie to start your day. Not only will it fill up you and your kids, but everyone will start their day right by giving your body all the nutrients it needs. 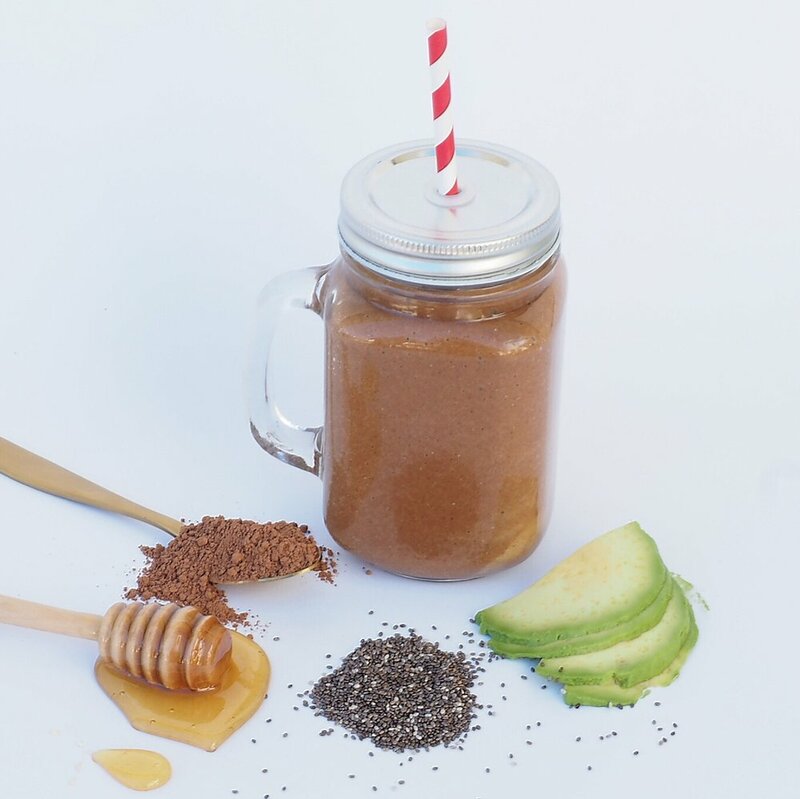 This smoothie is high in healthy fats and minerals which is needed for optimal brain and memory function. Cacao is high in minerals especially iron, calcium and magnesium. The importance of magnesium is its vital to over 300 essential metabolic reactions. Health benefits are numerous and include Heart Health, Brain Health, Diabetes - Improves the bodies ability to improve blood sugar, Asthma, Physical Endurance and Mood boosting. Beautiful part to Cacao is how it helps to balance our central nervous system and improving our heart function. The list is long for its health benefits and gifts one of natures best smoothie tonics. Goji Berries have been used in traditional Chinese medicine for thousands of years and it is claimed that they are one of natures remedies for a range of lifestyle diseases. They are a terrific source of antioxidants and certainly help to reduce fatigue and stress. With the addition of blackberries, raspberries and blueberries this drink will have you feeling fantastic! Method: Blend, Drink and Enjoy! What better way to start the weekend or end the week with a smoothie that creates a terrific release of inflammation from the body. Turmeric is the Golden ingredient and when you start to add it frequently into the diet it kick starts a long list of medicinal healing actions. Here’s a quick rundown of turmeric’s health benefits. - in Chinese Medicine as a treatment for depression. A great way to build the bodies immunity is through foods which gift the organs time to re-set and heal. This tonic is a great way for the family to start the day and kick any flu or bugs from the system quickly. Directions: Whisk all ingredients well and mix will make approx 6 shots. Top each one off with a pinch of cayenne. 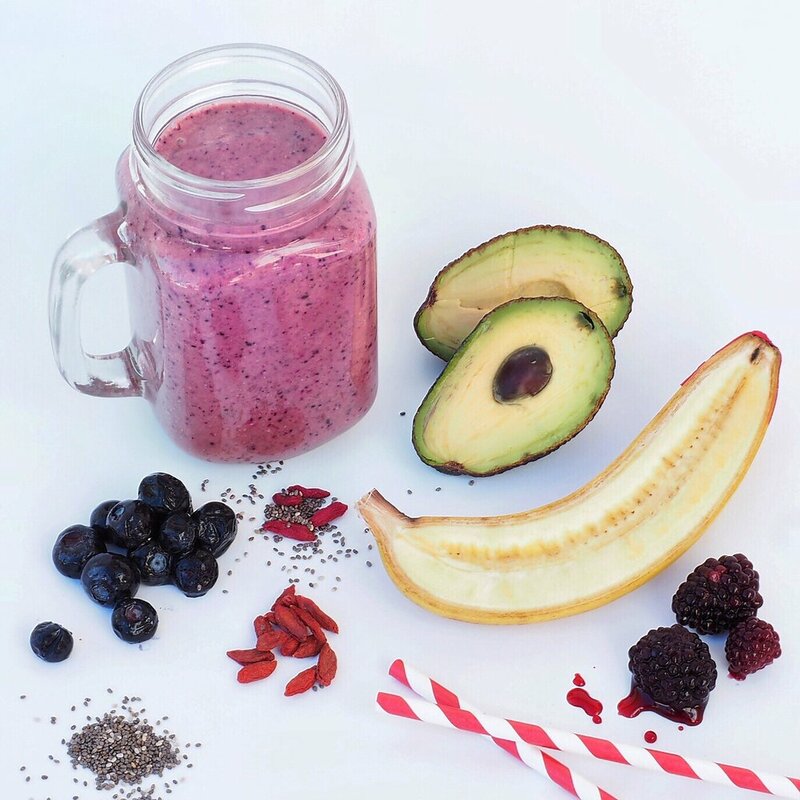 This smoothie was created by Marshall who is a member of Trading From Within. When you start to dive into the world of food then this smoothie begins to create SUPER energy levels which will last for extended periods and not just short bursts. When performing at elite levels in trading and activity, the longer we can stretch our energy and brain function out with dense nutrients, the more our bodies begin to act like a finely tuned machine, rather than a stimulated, stressed or forced machine from energy drinks or refined sugar. Nature always provides the ideal tools to create a powerful base when we start to use that opportunity. Bananas for the perfect potassium hit. Berries full of anti-oxidants and due to their strong antioxidant contents, berries also related to slowing the process of aging and preventing diseases related to cellular oxidative damage. Pasteurised egg yolks for protein and terrific omegas. Cacao the best Magnesium and Iron top up. Maca for hormone health and balancing out the Cacao within the body. Gelatin improves gut health, digestion, protects joints and lowers joint pain, helps improve sleep quality, lifts your mood and improves cognitive abilities, improves skin health, helps maintain heart health and maintains strong bones. Coconut water for fantastic healthy electrolytes and minerals. Nut milks to add some creaminess and healthy fats. Himalayan Salt for the best mineral hit. Bee pollen is the food of the young bee and it is approximately 40% protein. It is considered one of nature's most completely nourishing foods. It contains nearly all nutrients required by humans. About half of its protein is in the form of free amino acids that are ready to be used directly by the body. The perfect food for our bodies. Getting the morning cracking with the best Full Fat Berry smoothie for sustained energy and brain function. 50% of our daily energy is used during the thinking process and our brains being 60% FAT require healthy quality FAT to build and function at optimal levels. It's so important to start the day with what your body needs the most. This is another brilliant meal that ticks the box with High Healthy Fat for brain function, nutrient distribution and energy. Complete protein to repair and build the bodies muscles. Dense chlorophyll rich matcha green tea full of antioxidants which gives you 10 times more than normal tea (Hint - This is what the east has known for 1000's of years and one of the reasons why living to 100+ is normal) and natures superfood medicine of cacao for magnesium, cinnamon for balancing blood sugar, nutmeg to strengthen cognitive function and cayenne for our heart. Soak Matcha green tea , coconut milk with chia seeds for 30 minutes to create the base and Creating the most amazing chia pudding. Then to top it off the Cacao smoothie made of banana , Avocado , coconut cream , cinnamon, nutmeg and cayenne. The days of the one-size-fits-all approach to medicine are behind us. You and I are amazingly unique individuals, with our own complex blueprints for wellness and through FOOD we can achieve an amazing vitality . This green smoothie is a great example of the power of food as medicine and with the warmer days ahead it's the perfect way to power up the day and creating an amazing base for the day emotionally and physically. Trying to add more greens into your diet? This refreshing and detoxifying smoothie is the answer! Coriander, one of the top five heavy metal detoxifiers, draws out mercury and aluminium from the body and helps reduce LDL (bad) cholesterol while raising HDL (good) cholesterol. Cucumber is both alkalising and extremely hydrating. This powerful anti-cancer food helps reduce the risk of breast, uterus, prostate, and ovarian cancer. Avocado the best of best fats to fuel the brain - body and distribute protein throughout . Spinach strengthens the heart and brain . Coconut water it’s the perfect fuel for those of us who are constantly busy and requiring a lot of fuel to the brain and central nervous system . Chia seeds a complete protein and awesome cleanser of our digestive system. Banana for the perfect potassium hit and calmer of our nervous system from heavy work loads. Acai is the most amazing addition to the daily food plan and is a great way for women (or men) to begin, so they can reduce the use of make up, highlighters , fillers etc or anything that is artificial and placed on the skin to make it look like it is glowing and artificially healthy. Anything we place on the outside of our body gets absorbed into our liver for processing and nearly all the cosmetics used are essentially toxic and damaging. How do you know if your liver is toxic ? Breath on someone first thing in the morning and if it smells bad you guessed it , the liver is damaged and needs cleaning. Why not change the approach from trying to cover up the outside, improve the inside through food to allow the skin to glow naturally. Acai is full of essential fatty acids , Omegas 3-6-9 , Oleic acid and the powerful polyphenols so you won't need to put any of the toxic chemicals onto the skin. Great way to go ! With so many people running to the coffee machine first thing they wake it is no wonder so many suffer from 'BURNT OUT ADRENALS' and a highly stressed life. Unfortunately coffee is a drug and not a sustainable form of energy. Our energy centre (Kidneys, thyroid and adrenal glands) suffer at the hands of the daily and constant fix. Why not instead wake up to something that is a food and nutrition based option that will gift you energy and balance through out the whole day, rather than short bursts that will require topping up to gain the same stimulation again and again over the day. 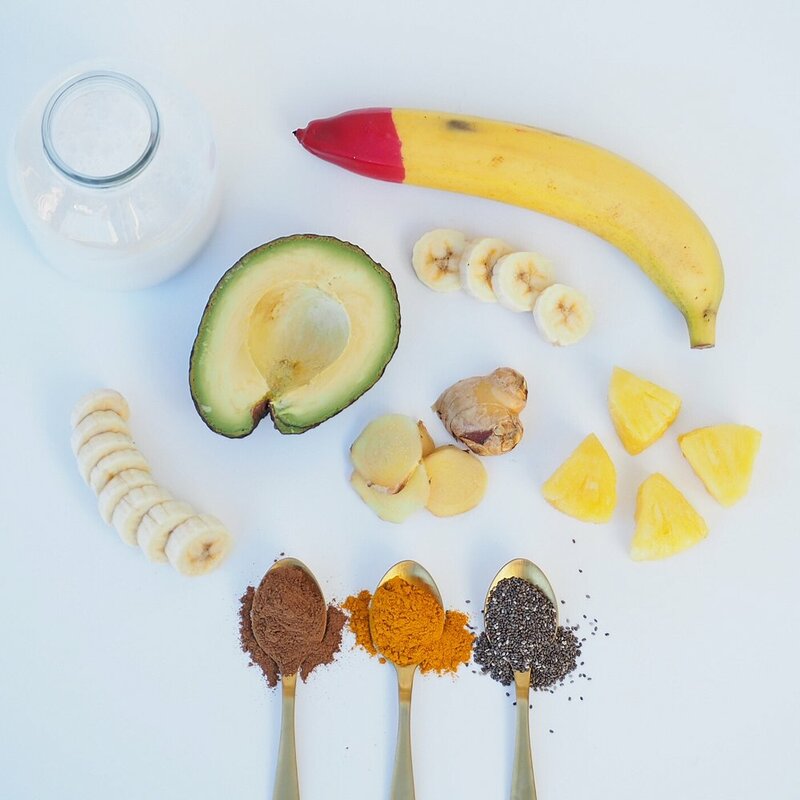 This smoothie includes all the daily needs for the body and being loaded with healthy fats and nutrients, once the body gets used to it you will start to be energised longer, far more relaxed, brain function in balance, leaner body, deeper sleep and quick recovery. There are lots of healthy ingredients here, but the real energy boosters are the coconut oil, avocado, banana and blueberries. And of course the healthy combination of fats, proteins and carbohydrates will give your body just the fuel it needs for sustained performance day after day.